I mentioned in my previous post that my teacher, Bob Davies, is an "old-school" teacher. I'm not sure how he teaches nowadays, but certainly my early years of training with him were underlined with a kind of discipline that would probably meet with grave consternation in today's Australia. Well do I remember his shinai stick (a split bamboo sword used in kendo) - affectionately named "Suzuki No. 2"1 - which he used as a "motivator" during heavy sessions. Students who were flagging would, without warning, receive a crack across the back or the legs - whereupon they would "miraculously" find a second wind. As I have said, this kind of disciplining method might be frowned upon today in the bulk of the developed world, but in the South Africa I knew, it was de rigueur. Caning was quite commonplace in schools for any number of "offences" ranging from not completing homework to "wagging"/"bunking"/"playing hookey". In fact, Bob's shinai caused more startle than it did pain - school caning was in a completely different league. However this didn't stop some of the students complaining. I remember a fellow named Mark who, upon receiving a "motivational smack" across his legs during knuckle push-ups, whined under his breath: "I don't want to do this anymore." I did note that his push-ups had improved substantially as he was saying this. I was never terribly concerned about Suzuki No. 2. I was more petrified of the potential intensity of the lesson. Sensei Bob had a knack for making us do things that seemed impossible (but in fact were not). Like the time I walked into the dojo and he said: "Right - one hundred front kicks." Easy, I thought. Then we swapped legs. Still easy. It was only when he said: "Next person counting!" that I realised precisely what we were in for. Two hours and about 2500 kicks (front and roundhouse) later I eased myself down the long flight of stairs, legs wobbling uncontrollably like jelly. Sensei Bob explained: "It is easy to do a small number of any technique well - but it is only when you're fully exhausted that your true technique comes out." Occasionally I will take my own students through a "spirit" workout (minus the motivational shinai stick). I'm also a lot kinder in another crucial way - I usually tell them what's in store. Sensei Bob had the habit of leaving you in suspense (more like terror). I have the feeling this was part of the training: when you know that you have x number of repetitions you approach the task with considerably greater ease. Not knowing when the pain is going to end is what adds real stress. But, as I'm sure Lao Shi Bob would say today, learning to deal with these unknowns is part and parcel of making a good martial artist. This kind of "spirit training" was and is integral to his methodology of training warriors. Once I remember he opened the lesson by talking about spirit training and its role in developing mental toughness. His foreboding message left us quivering in fearful anticipation. It took a while before I realised that we were already mid-way through the lesson. In fact, he talked for all but the last 15 minutes - after which we finally did some (brutally hard) exercise. But when you know there is only a quarter of an hour to go, you don't mind. I suspect this was, in itself, part of Sensei Bob's lesson for the night; don't sweat it until you need to. We'd practically pooped our pants for no reason. From those articles you'll see a common theme: how fear of something can be much worse than the actual event (note in particular my article "Decadal Gashuku Part 2: Ten Blind Masseuses"). This is a lesson that I have learned well. I can honestly say that my ability to tolerate discomfort has been greatly extended from that which it would otherwise have been. I have put this increased tolerance to good use in emergencies and other times of physical or emotional stress. What I have learned is that pain is finite; it exists for a time, then it is gone. Once it is gone you have no memory of it. You remember being in pain - but you can't actually conjure the sensation (as you might recall sights and sounds or even smells and tastes). This is, I think, part of the body's protective reflex: if we could all conjure up the sensation of pains previously suffered we would almost certainly all be emotional wrecks. For example, I have often wondered whether if women could accurately recall the sensation of giving birth, they would even contemplate having a second or third child! But I'd like to go back to my earlier remark about achieving "impossible tasks". While the Decadal Gashuku provided some examples of this, it wasn't until Lao Shi Bob's 1996 visit to Western Australia that I learned some of my most valuable lessons in "spirit training". The "final frontier" as far as I'm concerned, is doing without food - or water - while training. The latter is, understandably, dangerous and must be approached with considerable caution, but we did, at one point, do a 24 hour "waterless fast". Then later during his visit he held what is infamously remembered as the "Pine Cone Gashuku" at the Shannon National Park deep in our South West. On this camp we went on a 24 hour fast (water was permitted) - despite 8 hours of training per day. On the second day we were allowed to eat only uncooked vegetables - 3 different ones that I got to choose. I chose the heartiest, most "carbohydrate-rich" vegetables that sprang to mind: carrots, cabbage and beetroot. The latter choice was to have quite startling effects. On the day we ate the beetroot, Lao Shi Bob took us down to a field for rolls. From a distance one might have been forgiven for thinking it was a field of lush green grass. It was only when you came closer that you noticed the rocky ground, punctuated occasionally by the odd tuft of rough kikuyu. We were told to perform forward rolls, end on end, for half a kilometre - then return doing backward rolls. I emerged largely unscathed; a few bruises and a bit of nausea didn't stop me coming in a close second to Lao Shi Bob's visiting student, the "wunderkind" Nick "The Beast" Nell. But, upon completing the exercise I turned to survey a field of puking, ashen-faced students. And of course the field had, somewhat dramatically, become littered with piles of vomited, blood-red beetroot. It looked for all the world like some ancient battle scene. The "pine cone" reference I made earlier relates to Bob's chosen motivational tactic on that camp. Whenever we were flagging or failing to remember the intricacies of the Tenshin Shoden Katori Shinto Ryu bokken/jo drills, he would make us run for pine cones. By the end of the 6 days we'd assembled quite a high pyramid. Perhaps it is still there! This visit by Lao Shi Bob in late 1996 was to be my last training with him. It was shortly afterwards that my brother Nenad and I decided to "do our own thing". Why? There comes a time when one must leave the nest. Lao Shi Bob's unique training methodology, his particular emphases and his chosen direction (in particular his studies of Tenshin Shoden Katori Shinto Ryu) did not accord with our own desires at the time. It is very hard to follow in someone else's footsteps for one's whole life. We had followed his for 16 years - and now we felt it was time to make our own "fresh tracks". The intervening years have been challenging. The words of Chojun Miyagi after the death of his teacher Kanryo Higaonna come to mind: he felt he was groping his way along an unlit road. For some time I felt the same. However it has been a productive journey and one I wouldn't trade for any other. And this journey has indirectly led me to where I am now: an inner circle student of Chen Yun-Ching Shifu (shifu is another term for "teacher"). In this capacity I am exploring arts that I find enormously satisfying; moreover I am appreciating the continuum that these arts constitute with my karate and other arts. I feel I am inching ever closer to the holy grail of a unified, internally consistent, relativistic syallabus (see my article "My quest for martial the holy grail"). Chen Shifu has indicated to me that my status as his inner circle student in no way precludes me from training with other instructors and I am grateful for this. His own sense of security in his art (the art of his father, the legendary Chen Pan-Ling) is quite impressive. So I look forward to the day when I will once again see my first sensei and train with him. It almost came to pass that we would train side-by-side at one of Chen Shifu's workshops. This would have marked the first time I would train in this capacity with my former teacher. Unfortunately, Lao Shi Bob had other plans - notably his 88 temple pilgrimage to the island of Shikoku, a three month trek that ranks amongst the toughest in the world. However even if we do, by chance, come to train side-by-side, I rather suspect it will be impossible for me to defer to him as anything other than "sensei". 1. 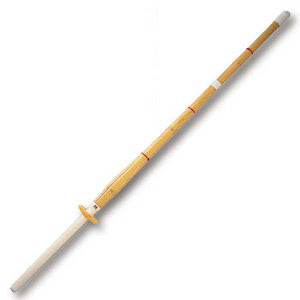 The shinai stick known as "Suzuki No. 1" had pride of place in the Cape Town dojo of Sensei Bob's teacher, the late Hanshi Denis St. John Thomson. That "spirit training" was and is the very essence of the martial arts experience. The things one learns, the self discovery that is sometimes more painful than the physical. The "bloodiest battles are truly waged within. Nick sensei still talks about the beetroot incident from time to time. Great story telling! Thank you for sharing your experiences. Thanks for reading Matt - I really appreciate it. Such vivid descriptions. What a terrifying and awe-inspiring man! Once again I am reminded that have it comparatively easy (for better or for worse). I am so grateful you are not Lao Shi Bob. PS: I think Kancho mentioned that Lao Shi Bob was not only one of the few people in the world to visit all 88 temples in three months, but had time to stop at additional temples along the way. He certainly doesn't sound like a man to do things half-heartedly. You do his legacy great justice. Yes that's right Xin. Laoshi Bob did the 90-something temples. Very impressive spirit! Extract #1 from "Essential Jo"